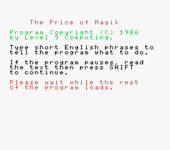 The Price of Magik recounts the sad tale of Myglar who, driven mad by the intensity of magikal radiance from the Moon Crystal that he had protected for so long, stole it. His aim was a vain attempt to squander its power and live forever. But a magician of great skill (who eventually rose to lead the Guardians) avoided Myglar's traps, recovered the crystal and ensured that magik survived as long as there was need for it.